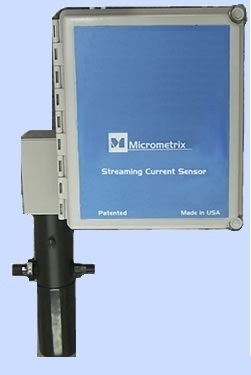 The Analyzer works using streaming current measurement technology. The general principles of how streaming current devices work are reasonably clear. Streaming current is generated by hydraulically shearing counter ionic charges from temporarily immobilized particles and by means of a reciprocating piston within a cylindrical cell. Electrodes that are embedded in the surrounding cell measure the current produced by this generation. The signal is then electronically processed and the output is the "Streaming Current". This current is due to the counter ions that are held close to the surface of the particle by electrostatic forces. As originally developed, streaming current utilized a capillary passage or cell, through which a fluid or filtrate solution could be forced by an applied pressure. Counter ions in the diffuse layer (Slip Plane) that surrounded the particle surface then migrated with the fluid creating an electrical potential or current (both which can be measured). If the current is measured, it is termed as streaming current. This current can be mathematically correlated to the electrical potential at the surface of shear between stationary and mobile portions of the fluid. Accurate reliable charge analyzer technology can help operators predict, analyze and correct process conditions in the wet end of the paper machine. The Wet End Charge Analyzer gives the ability to optimize wet end chemistry and control anionic trash. The Charge Analyzer is used as well to quantify the effect of various additives on system charge, providing a useful tool for assessing and improving process efficiency. Manufactured for easy maintenance and excellent reliability, the online Wet End Charge analyzer is the most proven technology available in this field. 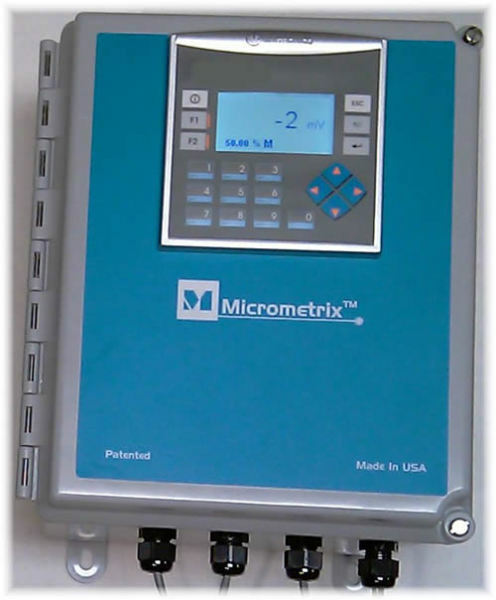 The analyzer is suitable for process control as well as an information source. Also no chemicals are needed for measurement and all the materials have been specially chosen for corrosion resistance. In many paper and pulp mills, the Wet End Charge Analyzer, has proven to be a solid tool for controlling both the process and the chemicals at the paper machines. The Analyzer uses multiple measurement points in the stock prep and wet end that help papermakers analyze the sources for anionic trash. The most typical installations in paper mills have been the automatic control of Wet End Charge Analyzer in the short circulation loop of the paper machine or in the wire pit. Several wet end measurements have been successfully used to help optimize additive usage and resolve problems such as deposits or poor runnability. However, few methods exist for monitoring the performance and effectiveness of total wet end conditions and how the condition affects the runnability and number of breaks on the machine. ​Minimal variability of the furnish charge (in the white water) is a critical factor to maximize the runnability and produce the best quality paper on any kind of machine. The stability of a paper machine’s electrochemistry strongly affects machine drainage, retention and the machines draws. Moreover, the wet end of the machine can be easily upset with increased water system closure and the use of recycled furnish.